Toronto, Ontario, March 19, 2019 – Magna Terra Minerals Inc. (the “Company” or “Magna Terra”) (TSX-V: MTT) (SSE: MTTCL) is pleased to announce results from a ten hole, 860 meter, diamond drill campaign on the Piedra Negra project in the Santa Cruz Province of Argentina. The project is within 30 km of the Vanguardia Gold Mine (Anglo Gold Ashanti - see figure 1). The drill program was completed in December 2018. Assays for holes PN_DDH001 through 9 have recently been received. The Company has completed a first phase drill program at its Piedra Negra Project, Santa Cruz Province, Argentina. Drill hole PN_DDH006 intersected 2.0 m of 0.655 g/t Au (from m 14 to 16) and then 1.0 m of 0.18 g/t Au (from m 26 to 27) (Table 2). The hole collared in argillized tuffs, and after 14 m, cut low sulphidation vein material. Further anomalous intercepts are reported in Holes PN_DDH001, 2, 4 and 7 and occur over an area of 700 by 500 m in the Vetas Hermanas and Puyutano Dome areas. 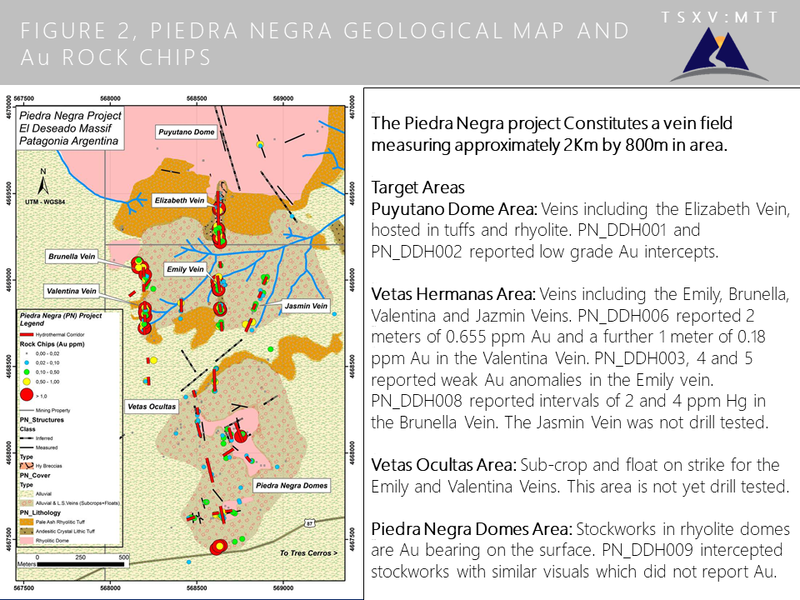 The Piedra Negra project is composed of four areas which we term, Puyutano Dome, Vetas Hermanas (including the Brunella, Emily, Valentina and Jazmin veins), Vetas Ocultas and Domos de Piedra Negra. These areas are illustrated with geology and surface rock chip Au in Figure 2. In this campaign we partially tested the Elizabeth vein at the southern edge of the Puyatano Dome Area. We also tested the Vetas Hermanas Area and the Domos de Piedra Negra down to around 100 m. The Vetas Ocultas Area remains un-tested. Collar data for the campaign are provided in Table 1 and illustrated relative to Induced Polarization at 90 m depth in Figure 3. 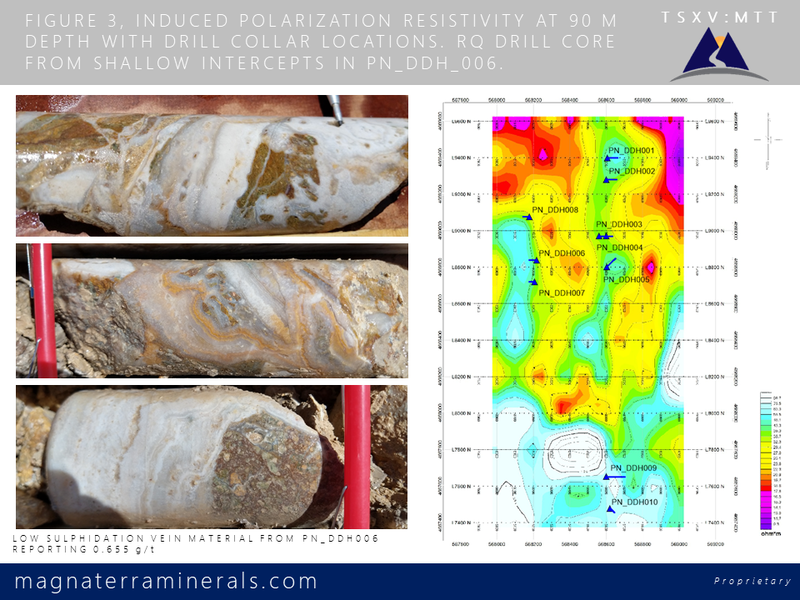 Chalcedonic silica in Au bearing intercepts along with a pervasive Illite Sericite alteration, combine to indicate that the drilling was restricted to the upper part of a low sulphidation epithermal system, implying further target potential at depth. Additionally, strong Hg anomalies, between 2 and 4 ppm in PN_DDH008 appear to form part of a regional pattern which relates the Piedra Negra Veins to the discovery vein at the Company’s Covadonga Project, 9 km to the West. Holes PN_DDH001 and 2 on the Elizabeth Vein reported 2.1 m of 0.24 g/t Au and 4 m of 0.135 g/t respectively. Whilst the intercepts are sub- economic, see Table 2, these holes were altered throughout most of the length and in the case of PN_DDH001, quartz veinlets throughout the upper half of the hole, tended to be parallel to the core. Additionally, the host rock, which is largely tufaceaous, is mixed with large rhyolite fragments from the Puyutano Dome to the North. The general N-S orientation of the veins at surface does not appear to hold at depth where mineralized targets may be orientated E-W in zones of dilation and along the southern flank of the Puyutano Dome. This area was not drill tested in this short campaign and will be considered for the future as surface geology and Induced Polarization data show targets on strike with the Emily and Brunella Veins. Holes PN_DDH009 and 10 were drilled in this area and targeted fluid traps beneath surface stockworks in rhyolite domes. PN_DDH010 was cut short of target for technical reasons. PN_DDH009 cut 29 m of rhyolite dome with stockwork, breccias and quartz veinlets, followed by 6 m of andesitic tuffs with silicification and brecciation with disseminated pyrite. Unlike the surface rock chip sampling, the hole was barren. Further QAQC procedures will be undertaken before making a decision on further exploration in this area. The Company is currently evaluating these results with a view to designing a future exploration program which would include all of the four target areas, and would also aim to examine the ground between Piedra Negra and the discovery outcrop at Cerro Covadonga. Sampling was carried out at the drill site, with core being cut by angle grinder and half of the core retained for logging and potential re-analysis. Blind standards, blanks, and duplicates were inserted into the sample chain accounting for 14 % of samples. Samples were then delivered, by Magna Terra staff, directly to Alex Stewart Laboratories in San Julian, Santa Cruz, Argentina, for sample preparation and subsequently shipped to Alex Stewart Laboratories in Mendoza, Argentina, for gold fire assay and multi element analysis. Intercepts were calculated using a 0.1 g Au/t cut off. Magna Terra Minerals Inc. is a precious metals focused exploration company, headquartered in Toronto, Canada. Magna Terra (MTT) has a significant interest in the province of Santa Cruz, Argentina within the prolific Deseado Massif in southern Patagonia. With five district scale drill ready projects, and a highly experienced management and exploration team, MTT is positioned to deliver significant shareholder value through the potential for precious metals discovery(s) on its extensive portfolio. For detailed information regarding our projects, please visit the Company’s website at: www.magnaterraminerals.com. Cautionary Statements Regarding Forward Looking Information.